And as always, if you want to come back to this later, or just because you love greyhounds, go ahead and PIN this! Have their personalities changed since you brought them home? Of course they are both more comfortable in the house and with us, but for the most part their personalities haven't changed! Nash is extremely happy and excited when he is playing fetch. He has the biggest smile on his face. He would play fetch ALL day. Nash loves his mommy. But I will be honest, he's more of a daddy's boy. Although my (puppy) mama heart loves to see this, it also breaks my heart a little bit that he isn't cuddly to me. I think it's because Bryn feeds him all the time. They both follow me around the house. We were told that boys were bigger lovers than girls. I think this is true for us. We cannot leave the room without them following us. I would have to say that although Nash is a lover, Roman is even more of a lover. He is always where I am. And loves the attention. Look at that nose! He is constantly aware of everything that's going on in the kitchen. He has a super nose I think. This handsome boy is the baby of the two boys. He will be 3 in a few weeks. But friends, he is the best dog I have ever had. He's seriously perfect. Except for occasionally stepping in poo outside! He loves car rides, he loves attention and he loves his mama. Do they still get along with each other? We are so thankful for this. The answer is yes. They share everything. They take turns playing fetch. And they look out for one another. Do they ever get into trouble? I wouldn't call it trouble. But Nash is quite the curious pup. If he sees a bag, he's going to look in it. If there's a dog toy in the bag, he will find it, pull it out, and start playing with it. Nash also likes to find cozy spots to lay. I'm not sure if he was hiding or if this was just comfortable for him? Either way, he's laying in my plants! One more example. We had a huge tree cut down in the back. And there was left over tree mulch. So, Nash took it upon himself to make a nest. 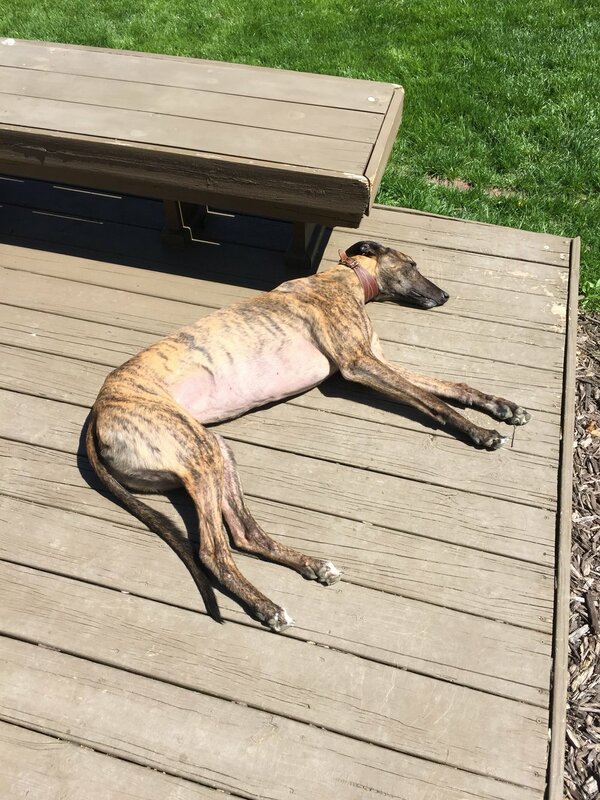 Meanwhile, Roman just sleeps on the deck. I told you, he's such a good boy! Do you plan to adopt more greyhounds? Right now, no. We know people who have a lot more than two greyhounds. Bless them! But two is enough for us. But if you're interested in adopting one yourself, click here to see the Greys ready to be adopted! Our best attempt at a family photo. So typical! Have you recently adopted a Grey or another pup? How are your pups adjusting? If you have more questions about our experiences adopting greyhounds, please send them my way, I'd be happy to answer them for you! Older Post10 ways to make your house a home.